It’s finally starting to look like the world wheat glut has peaked. Dry, hot weather from the U.S. to Europe is taking its toll on crops, and the U.S. government is forecasting global output will fall for the first time in five seasons. The adverse conditions have pushed benchmark futures in Chicago to their best start to a year in a decade, a stark reversal from the previous four years when burdensome supplies dragged down prices. It isn’t just the weather. Years of low prices encouraged farmers to plant less. While yields are up, quality has declined and the grain contains less protein. And a changing climate means more heat and dry spells everywhere. Globally, this spring was the second-warmest on record, trailing only 2016, according to the National Centers for Environmental Information in Asheville, North Carolina. The weather woes have already spooked bearish hedge funds, who cut back holdings for a third straight week. As of June 20, money managers held a net-short position, or the difference between bets on a price decline and wagers on a rise, of 20,971 futures and options, according to U.S. Commodity Futures Trading Commission data released three days later. That’s the least bearish since November 2015. On the Chicago Board of Trade, benchmark wheat futures have jumped 15 percent in 2017 to $4.7075 a bushel. Prices are trading near a one-year high. 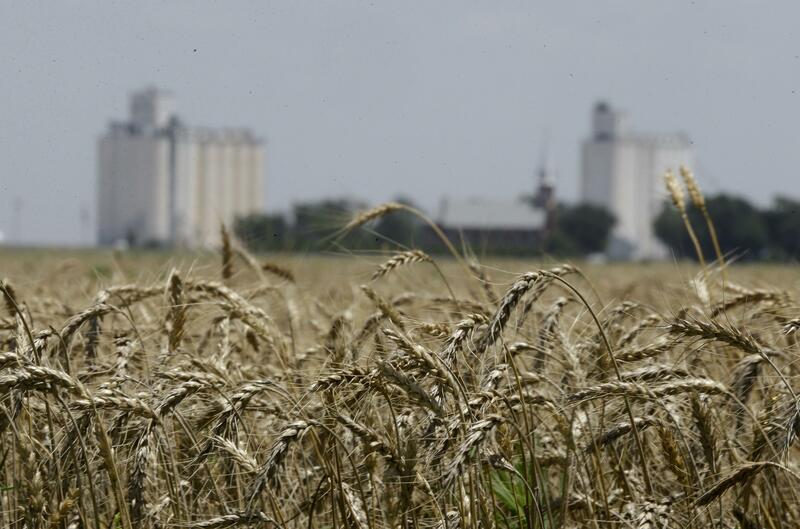 U.S.: Farmers are in the midst of harvesting winter wheat across the Midwest and Great Plains. Production will be lower than last year after growers planted the fewest acres in a century, and initial testing data suggests that the hard red winter crop, the largest variety grown, will have lower-than-average levels of protein for a second straight year. That’s boosting demand for the high-protein spring variety, grown in northern states that have been plagued by drought. Conditions for the crop are the worst for this time of year since 1988. The dryness in the north is coming after other parts of the Plains had an usually wet spring and late snow that hampered winter grain. In Canada, some areas have been too wet, while others too dry, and many spring-wheat crops are developing at a slower pace than normal. Plants on Edward Kessel’s farm in southwestern North Dakota, near Belfield, are only about a foot tall (0.3 meter) after a dry spring. Yields may shrink to 20 bushels per acre, compared with 40 to 50 bushels in a normal year, he said. Europe: A heat wave gripping western Europe is threatening production, as rising temperatures curb the potential of crops entering the critical grain-filling stage. Paris futures tracking milling-wheat touched an 18-month high last week. Output is still expected to rebound from last year’s disastrous crop, which was harmed by flooding. Still, analysts are rapidly trimming their expectations for the harvest. “The market is still not pricing in this hot-weather risk,” said Didier Nedelec, director general of French farm adviser Offre & Demande Agricole Groupe. The group has cut its outlook for French wheat production to 35 million metric tons from 36.4 million, with further reductions possible. Australia: Production is expected to total 24.2 million tons this season, down 31 percent from last year’s record harvest of 35.1 million, according to the latest government forecast. While eastern states have seen favorable soil moisture, below-average rains in the west triggered unfavorable planting conditions. Ongoing dryness may reduce wheat acreage, according to Commodity Weather Group. China: While the USDA forecasts that record Chinese production will help stockpiles surge 16 percent to 128 million tons, the hoard will likely do little to ease global supply tightness because the nation exports very little. The country’s reserves will account for almost half of the global total, underscoring the shrinking cushion. Removing China’s inventory from the world balance sheet shows ebbing stockpiles and a clearer view of the global supply and demand picture, said Tanner Ehmke, a senior economist at CoBank in Greenwood Village, Colorado. Argentina: While most countries grapple with dryness, in Argentina farmers are suffering from too much rain. After consecutive years of heavy rains, about 100,000 hectares (247,000 acres) of waterlogged fields in the country’s main crop belt may not be planted. Still, favorable conditions in southern Buenos Aires province, known as Argentina’s bread basket, and in the north could help compensate for lost acreage. At the same time, the scrapping of an export tax means many farmers were eager to boost plantings. Black Sea: One bright spot for production is in Russia, which is expected to leapfrog the U.S. to reclaim its position as the world’s No. 1 wheat exporter in the 2017-18 season. Consultant IKAR boosted its forecast for production recently, citing plentiful rains in parts of the country. Published: June 26, 2017, 12:14 p.m.